On Saturday, I highlighted the recent release of Friendly, an iPad-optimized application for Facebook that enhances the world's most popular social network to take advantage of the iPad's screen and touch interface. One of the co-founders on Friendly and Twazzup, its sister product, Cyril Moutran (@mocy), met with me for lunch today and discussed how developing for the iPad presents new opportunities to make a splash in a less-crowded field, and gain real revenue. He also said he believes the launch of more touch-centric interfaces could be as revolutionary as the mouse and hyperlink did with the first generation of the Web. Since its launch late last week, it would be safe to say that Friendly is seeing initial success. Despite its $4.99 price, the Friendly app has bumped into the list of the top ten paid iPad applications on the iTunes store, and sits at the #13 position overall right now, and is the #15 most grossing application across all of iTunes' iPad apps, going up against Apple's office productivity apps, and even beating out MLB's At Bat application for the iPad, which is in the #25 position. Just yesterday, Moutran said the application was purchased in 60 different countries around the world. 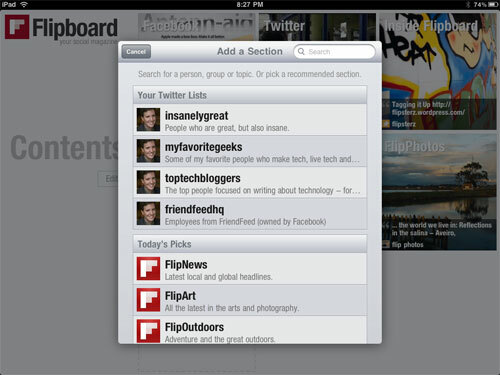 And yes, the app sits in the #1 spot for paid social networking apps for the iPad, as many of the apps are free. 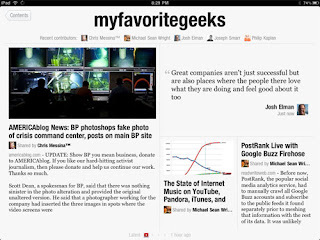 Moutran, who also counts time at Netscape, Schlumberger and Vignette on his resume, believes part of the reason for Friendly's success, as well as that from other iPad apps that have sold well, is their development of a unique experience that takes full advantage of the product's touch-based characteristics. 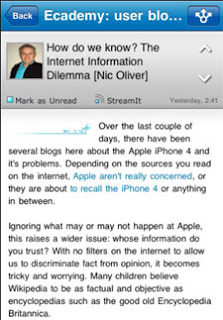 Rather than expand a game to the full screen by doubling pixels, or hoping a more standard interface of small links and pixel-perfect clicks are going to be good enough, he suggests smart developers need to recreate their products for this new experience, and when there is a gap that needs to be filled, as there was with Facebook not having a dedicated iPad application yet, smart entrepreneurs will fill it. I managed to get Moutran to do a quick interview, which is embedded below. Hope you listen. Whether it's a fad, or a trend, or the next generation of the world's currency, location based services are much-discussed these days, and there is no argument that you are in the driver's seat. Barring massive disaster resulting from failure to scale, or the introduction of much-hated new features, the current competitors are not going to shake you from your perch, and the big guys (you know who) don't look like they want to go "niche" but treat LBS as a feature. So you're in a good spot. But... hey. Let's talk. Here's the issue. I've been "playing" with your service for the last few months, checking it at places both interesting and mundane. I've racked up my unfair share of mayorships of mediocre venues - from Grewalz Liquor & Groceries and Susan's Donuts to Carl's Jr. and the A&D Food Mart. In addition to these crowned venues, I've also racked up stops at businesses from gas stations to post offices, banks and restaurants on the Peninsula. But now we have a problem. This Friday, I moved. I didn't go too far. Just about 2.3 miles, if Google Maps is to be believed. But this, in terms of Foursquare, might as well have been 230 miles, because now, the old Safeway, where I had 18 check-ins, has been replaced with one where I've only visited a single time. The same issue rings true at the world's favorite mini-mart, 7-11, where I had six check-ins and now have to start over from scratch. You might have seen CardStar's news of integrating with you. Heck, what am I talking about? Of course you know. Well, they're doing this tie-in with loyalty cards, and as far as these "new" venues see it, I've never been there before. I might as well be some tourist who stumbled over from the airport in a compact Ford Focus that smells like vanilla. Here's what I want. I want credit for time served. I want to migrate my check-ins from one 7-11 to the other. I want my check-ins from Safeway in Sunnyvale to move to the um... other Safeway in Sunnyvale. I want to move my check-ins from one Burger King to another and from one Wells Fargo to another. I'm even willing to take a hit in the conversion. Maybe my 10 checkins are now worth 6 or something. Put Siobhan Quinn on the case - I know she's smart and the math isn't too rough. I'll even send over an Excel doc if it speeds things up. It's not that I am a Foursquare addict. Surely I'm not. There's no way. 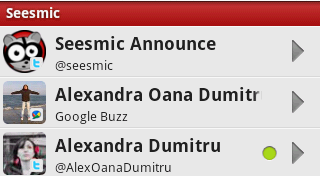 I mean, yes, I did speak at last week's Geo-Loco conference, but that was just a favor for a friend, right? 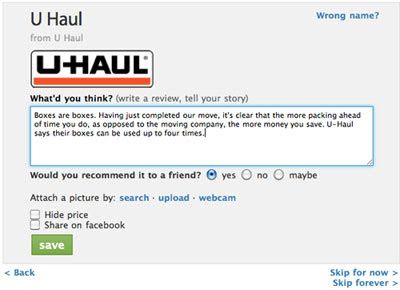 So pass along a "He's Moved!" badge and let's get this conversion going. Don't make me look like a N00b. Thanks to advances in the Web's real-time infrastructure over the last few years, our acceptance of latency or delay in discovery has practically been eliminated. We don't want to wait minutes or hours or days for news and information, and the freshness of content is essential. Often, when people want a near-instant reaction to world events, they're not looking to a filtered editorially driven source, such as CNN or Yahoo! News, but instead, they are looking to social networks like Twitter and Facebook, and often blogs, to get the very latest. This drive to be completely up to date has led to the development of tools that drive instant notification of "matches" to saved queries. Early in Twitter's infancy, one had the option to "track" a word and get instant notification of its being tweeted. 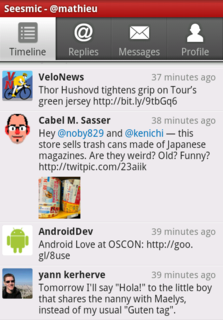 But due to Twitter's rapid growth and some infrastructure holes, the feature has long since been dead. In its place has risen third-party tools and products that tap into Pubsubhubbub, a real-time notification protocol powering most of the world's blogs today, and many different content sites. Among the most aggressive promoters of Pubsubhubbub and real-time notifications has been Julien Genestoux of Superfeedr, an infrastructure for real-time parsing of feeds in the cloud. Superfeedr recently launched a "Track" tool to instantly find Atom-based entries that match keywords pushed to a developer's application. 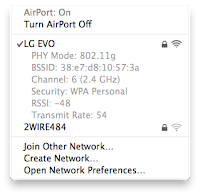 One of the simpler and more interesting applications of this tool that I have seen is called Supertrackr. 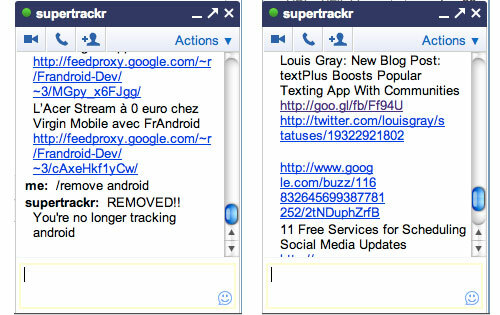 Developed by @Harper, Supertrackr operates within any Jabber-based IM client (or Google Talk), and lets you follow or remove keywords, via something of a command line, and get updates instantly. 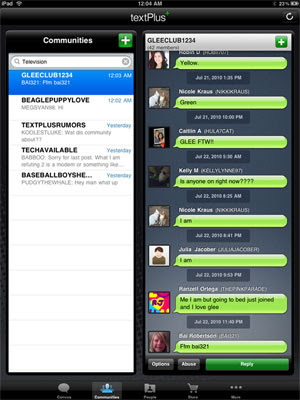 The app taps into Google's App Engine and Superfeedr to drive results into your chat window as new entries. 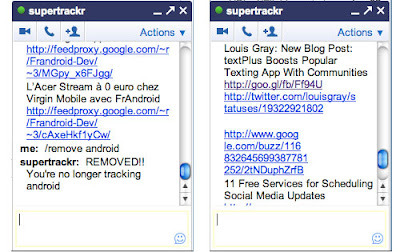 For practical purposes, you probably don't want to "track" popular terms like "twitter" or "android" or "e-mail" because your chat window from Supertrackr would get flooded and you would have new entries before you even acknowledged the last ones. I tried, and it works, as advertised. Operating Supertracker is as easy typing "/track word" to follow a term and "/remove word" to stop. So if you are in a Jabber-based IM client or use Google Talk often, you could be leveraging Supertracker to find all URLs discussing hot topics, or following your company or brand. 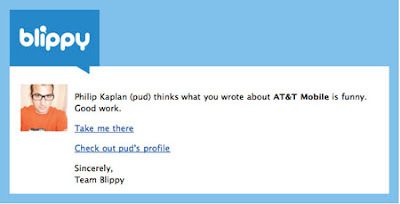 Twitter may not have brought Track back, despite Steve Gillmor's insistence they do, but other developers are filling the gap to get us closer to that monitoring utopia of instant notifications on anything from any source anywhere. 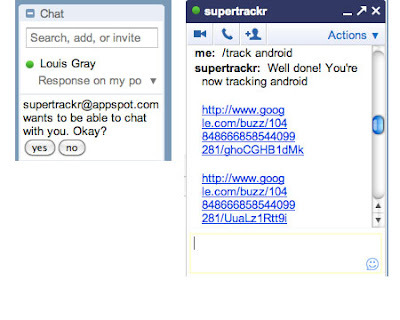 Check out Supertrackr at http://www.supertrackr.com/ or Superfeedr at http://superfeedr.com. Facebook is the most popular social networking site in the world. The iPad is probably the hottest gadget in the world. It makes sense that the two products are on a collision course, as an increasing number of mobile Web users experience Facebook through their tablets and touch screens. But so far, Facebook has not yet debuted an iPad-optimized experience, relying on its solid iPhone application and its mobile Web site to make do. In this vacuum comes Friendly, from the team that brought you Twazzup, the innovative Twitter Web client, and the results, as you should expect, are very good. 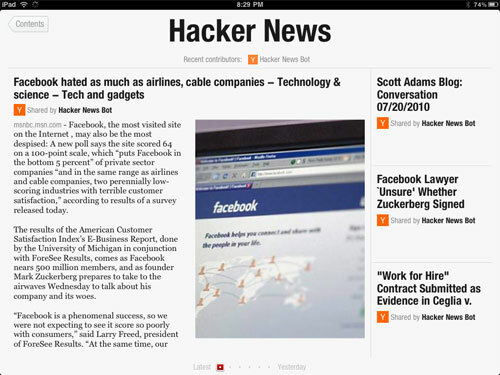 The experience is optimized for touch, and takes full advantage of the iPad's screen real estate. If the app were available free from the iTunes store, I would encourage everyone to switch immediately. 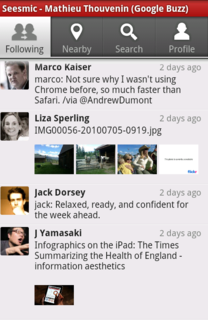 As it is, its $4.99 pricetag is still alluring for those tired of compromise when it comes to Facebook and the iPad. Cyril Moutran, cofounder and CEO of Twazzup, and previously the founder of Yokway, said in an e-mail yesterday that over the last few months the company has shifted its development efforts to the tablet format, and Friendly is the first major launch bearing the fruits of that labor. 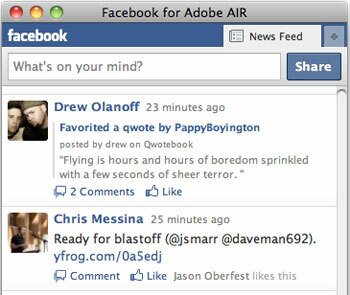 As you can expect, thanks to the nature of the product, Friendly brings all the major elements of Facebook directly to the iPad, including browsing the news feed, full of updates from your friends, and enabling you to take actions on those items, or update your own status. 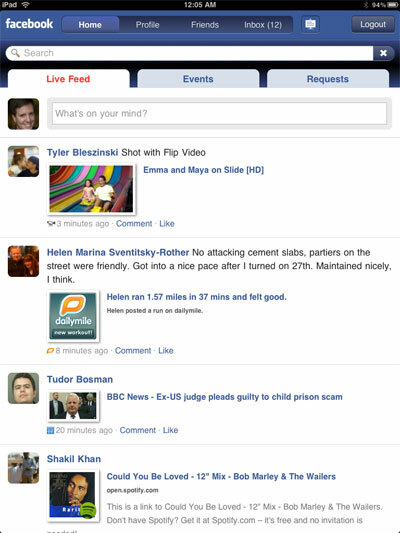 The application is delivered in a very clean way, with tabs for "Live Feed", "Events" and outstanding "Requests". 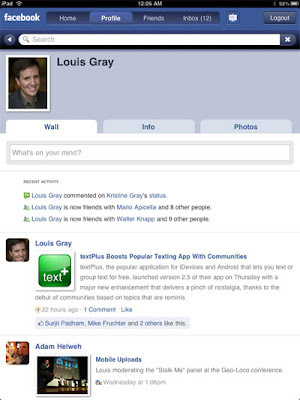 This tabbed model trumps the button selections on today's Facebook for iPhone offering. 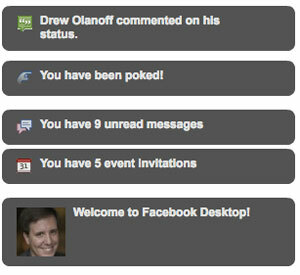 In those cases, selecting a section (like Photos) siloed your activity, while Friendly keeps you one click away from all major parts of the site. 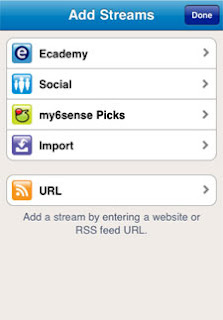 Atop the application are quick links to "Home", "Profile", "Friends" and your Facebook in box. As you navigate the product, you can hit any of these options, or click the back arrow to return to the previous page - just like a real browser, which is how the product is described. Like a real browser, Friendly does not compromise in its capabilities either. Clicking a YouTube ,video displays it in full glory on the iPad's screen, and you also gain the opportunity to edit Facebook fan pages, if you are an administrator, an increasingly important position for the network as activity morphs from being completely casual to more professional. After last week's post showing how many people use LinkedIn as a stale resume repository and are not tapping into the business network's many benefits, a follow-up video has surfaced from YourBusinessChannel highlighting common myths about the network. Have you run into the issue where you think you have enough connections on LinkedIn and don't need any more? Ask yourself a follow-up question - does your business have so much revenue you could not possibly need another dollar? Mark Perl, a renowned LinkedIn expert, and I talk about the value of the network, contrasted with other sites, including Google and Facebook, and how you can take your static profile and make it an active one with new connections and recommendations. Flipboard emerges tonight after lifting the shroud of secrecy on the project. The company has raised millions from VC firms including Kleiner Perkins, and the company has already made an acquisition, that of the Ellerdale Project. The Ellerdale team will be leaving their Menlo Park offices and joining Flipboard in Palo Alto at the combined companies' new headquarters, as they work on the new app. 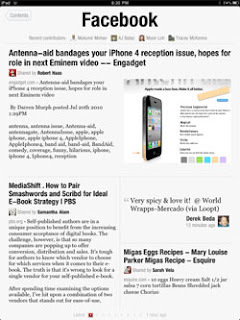 As I met with the team today, they described the fit as a perfect combination of Flipboard having an amazing front-end with Ellerdale providing strong back-end data. 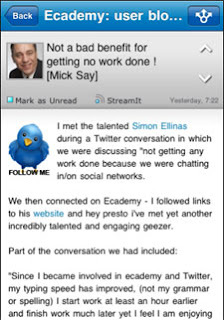 Ellerdale, if you may recall, was among the first partners to gain full access to Twitter's firehose of data. 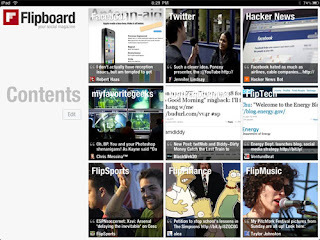 Upon downloading Flipboard to the iPad, users are prompted to follow a number of curated collections of news sources, supplied by the app, or to connect their social streams, starting with Twitter and Facebook, to one of 9 squares, aligned in a 3x3 grid. 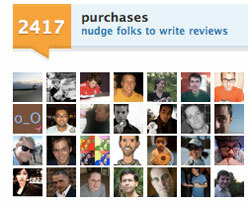 You can even add Twitter lists you have made, to see a subset of those you follow in a new way. 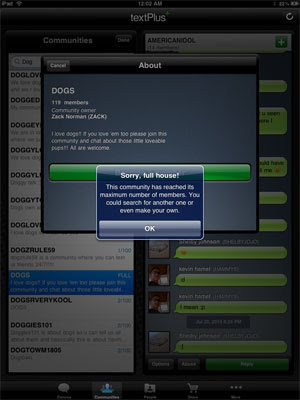 Future versions of the app are expected to offer more than nine tiles, and will also see support for new networks, likely including Google Buzz. After years of getting used to paging from the top down to see one-liner updates with a URL that launches a Web browser, Flipboard brings us back to the more traditional days of a cover page and flipping casually left to right to get to later pages of a magazine. 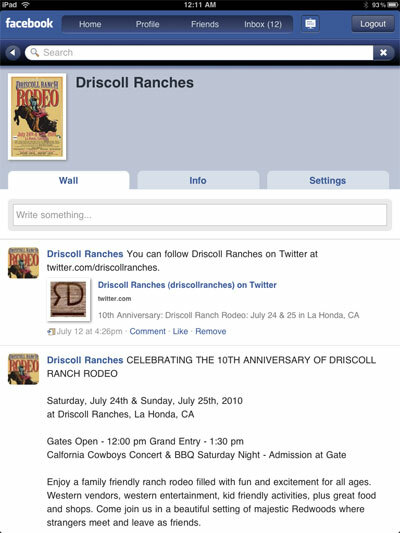 Rich media from Twitter, Facebook or any other feed is displayed in line, including photos and video, and Web links are displayed with a preview excerpt of the story - while clicking out takes you to Safari on the iPad. In the past few years, we have seen the debate rage of whether Twitter has surpassed RSS readers in terms of finding the best content on the Web quickly. Flipboard helps make services like Twitter and Facebook much closer to RSS readers, with a much friendlier UI that makes sense even to the most casual non-geek. 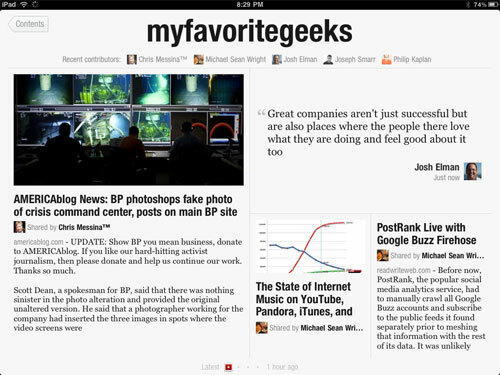 As the company described a meeting I had with them earlier today, this is the first "social magazine" for the iPad. The first page shows the most recent items from your stream, diving into the links shared from all those you follow, and as you flip the page left to right, you go back in time. Every person using the application has a different set of content and a personalized experience, based on their own social network. 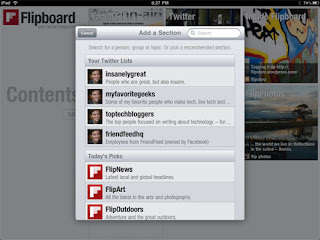 While the application itself is downloadable for free, Flipboard is already thinking about rich ways to receive revenue. They explained their plans for full-page high quality ads, much like those in print magazines, and used similar language to that of Apple and iAds. But they didn't talk about a way to reward original content creators, or their downstream sharers, for their work. 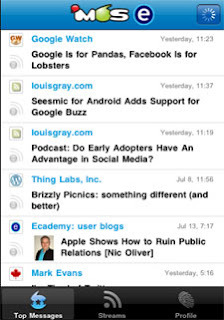 Theoretically, as third-party ads against RSS feeds have raised concern, this move may as well, unless it is assumed that third-party ads against excerpted articles is within the gray area. 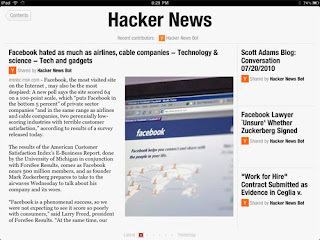 A New Way to Read Hacker News! In addition to browsing the articles themselves, you can see downstream conversation around the original content - be that comments on Facebook, or tweets from your friends that contain the specific URL. 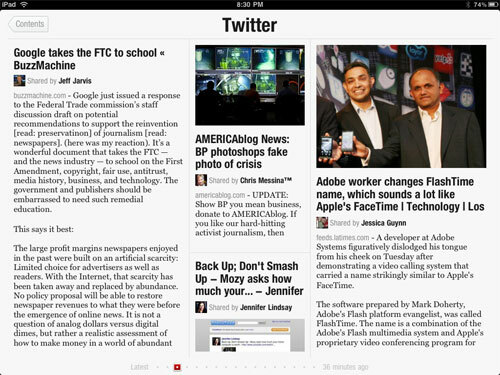 You can engage in that conversation from Flipboard by replying to Twitter shares or adding your own comments to Facebook, but it isn't aiming to be yet another Twitter client, so a TweetDeck or Seesmic killer this is not. 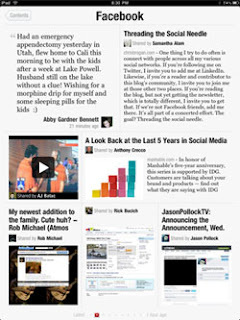 With Flipboard's unveiling, this closes the door on Ellerdale outright. Their site is expected to be made end of life as soon as tomorrow.